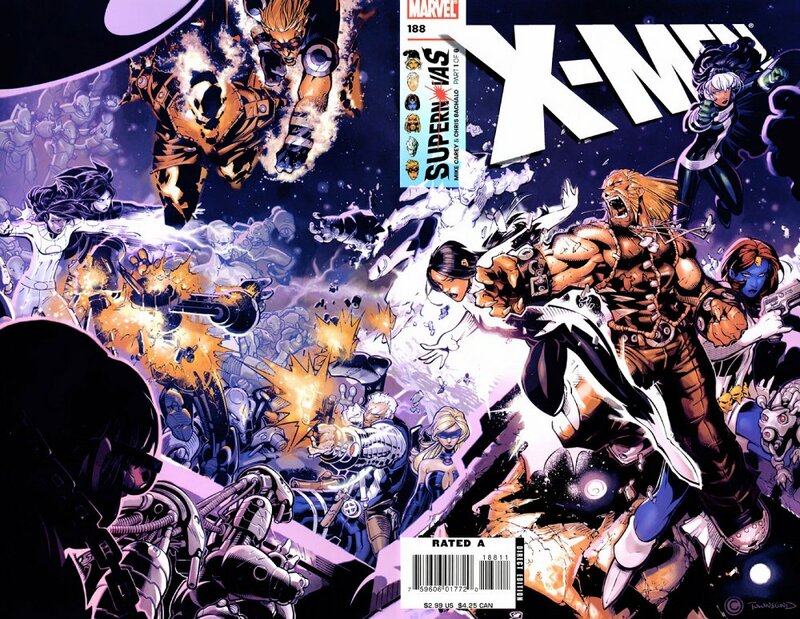 Mike Carey’s first issue of his beloved run on X-Men and he could have had no better artist to launch his run than Chris Bachalo. Looks at that wrap around cover, Marvel hasn’t done one of those in forever. Aurora does not appear in this issue. Issue opens with Sabreooth in Nogales, Mexico – lovely city. He is bandaged up and covered in various blankets, he is looking very tore up. He enters a bar looking for his contact, Tomas, he is trying to sneak into the United States. Tomas tells him that there is a plane waiting for him at Setter’s Point and that his bad of everything that he left with him is there. Tomas swears that he didn’t touch of any his stuff. Sabretooth states, that if he had, Sabretooth would be back to kiss his kid good night. Which is truly creepy and I wouldn’t put it pass him to do such a thing. Sabretooth leaves the bar. Tomas buys himself and a bartender a drink, telling the bartender that the most dangerous man he knows, is running scared from something. Which is a good, if not done before, way to set up a new villain but that’s okay. It has been done before for a reason. 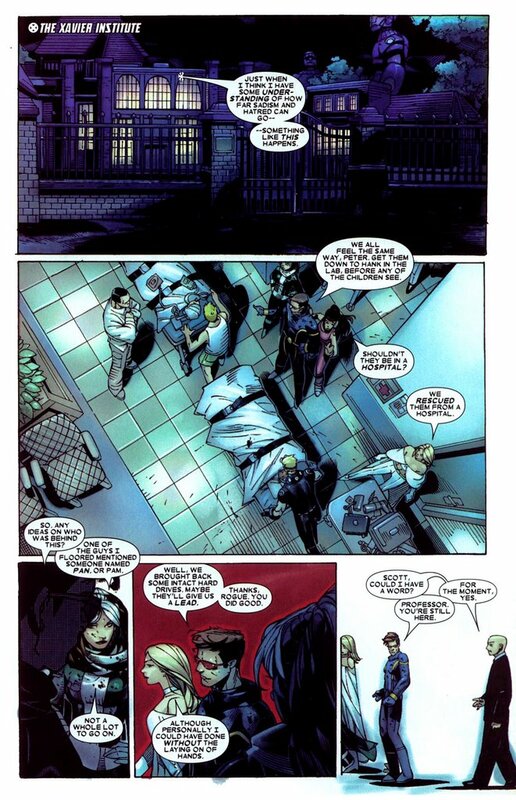 At the Fordyce Clinic – Rogue, Cyclops and Emma are thrown through a window. Cyclops and Emma are knocked out. Rogue calls Beast over their radio, he asks why she’s using the radio and she tells him that Emma is knocked out. Rogue tells him that they may be at a hospital but once inside, there are soldiers inside with psi-blockers and giant guns. The X-Men are at the clinic as they detected a faint mutant signature and were there to investigate. The other members of the team, are Cannonball and Iceman. Bachalo’s Iceman looks pretty sleek and cool, pun intended. This is during the Post-House of M / M-Day situation so there are only 200 mutants around. The Mansion has been turned into a refugee camp, the X-Men have announced that they will house and protect all mutants, no questions asked. Also, there are Sentinel O*N*E that follow mutants around. At the mansion, there are at least five at all times surrounding the mansion, and at least one goes with every squad as they head out on missions. The O*N*E models are sentinels but operated by human soldiers. So one of those O*N*E Sentinels is at the clinic too. Rogue shouts at the sentinel if he would want to help out, and gets no response, which she expected, she knows it is up to her now. Beast asks her what she is going to do. Rogue takes off a glove and touches both Cyclops and Emma, absorbing their powers. Rogue goes back into the clinic and starts optic blasting fools left and right. A doctor shouts that there is still a mutant standing, and two more soldiers come into the room. One of them hints that a Pan wants them to delay the mutants as long as possible. The other soldier states that mutants always try to look strong but are not that impressive once they are on their lab tables – going as far as to hint that dozens of mutants have gone through the clinic. Which of course, angers Rogue. Rogue turns into diamond form, blasts herself and causing a slew of ricochet blasts to take the soldiers out. It is very impressive to see. Even more impressive is the the two page spread of the aftermath. The left side of the page with the soldiers knocked out and the right side of the page is Rogue, in diamond form, excellent use of white space. We catch up to Cannonball and Iceman as they are having a good time talking amongst themselves as they search for the mutant they are there to save. There is an ad for the animated movie, Monster House. Which I only saw as it was nominated for the Best Animated Feature, and it lost to Happy Feet. The film I still haven’t seen, so I was rooting for Cars or Monster House. Back when I could watch films at my leisure. They come across one of experiment rooms filled with tanks and beds. Cannonball, doing research on one of the computers (proving that the school did teach him something) and announces what the goals were – to splice mutant DNA with various viruses. Once they got these mutant viruses, they would inject them into humans and see what happens. There is an ad for Ultimate Avengers 2 which was a direct to DVD original tale of the Ultimates. I thought it was a major let down from how great the Ultimate Avengers DVD was. I still wish with the Disney purchase, that we would be animated DVDs like how DC does with their annual release of new animated features. Iceman protects Cannonball from a soldier and Cannonball finds their target. Turns out, Lady Mastermind was the faint signature. She is in a coma at the moment. They also find Omega Sentinel. Emma confronts Rogue about the hangover she is dealing with now. Rogue states she wasn’t thrilled about the experience herself. Cyclops gets an update from Cannonball on what he discovered. Emma comments that the clinic took a huge amount of damage, which Cannonball implies that he will level the place once they have everybody saved. Nogales, we see the two individuals, a man (Sangre and an unnamed lady) who are on Sabretooth’s trail. He can detect that he was here, lingered and has moved on. They are onto his plan to enter the United States. They come across Tomas, and they can confirm that Sabretooth touched him. This is all they need to know and go about cleansing the place. They do this by dropping a giant spikey black ball that destroys everything in its path. The unnamed lady, of the two who shouldn’t be named, really? Touches a girl who Sabreooth completely ignored earlier in the issue. This girl is saved from the black hole spike bomb – it is called a singularity generator, which doesn’t explain what it is better than my two attempts. There is an ad for the Heroclix X-Men Danger Room set that instead of an Iceman figure, they put Storm and Colossus in the set. Which seems awkward to me with Cyclops, Angel, Jean and Beast all included. At least include Iceman or leave out Colossus, Storm is a get though. These two individuals apparently appear as ghosts, as no one can see them. We find out that the bomb as a range to it so only what is inside the radius will be cleansed. The young girl has been shielded from the bomb. Sangre asks if this was due to sentiment. His companion is quick to state it was merely for distraction. Back at the mansion, we get the scene that I bought this issue for. Actually, I had already bought it but it was in my To Sell boxes (that I still have eight of!) that I’m slowly selling to Lonestar Comics. Comicbookdb states Kitty is in this issue and I didn’t remember it. Marvel Wiki and Uncanny X-Men.net state it is an unidentified female mutant. Once I read it, I have to confirm comicbookdb that it has to be Kitty. We see Colossus being amazed that after all of these years, humans still can surprise him with how ruthless they can be. Also in the scene is Rogue, Cyclops, Emma and a brunette in a full pink body suit, asks shouldn’t these two ladies be in a hospital. To which, Emma states that they were in a hospital. I also think this has to be Kitty, as Colossus is there, and Emma finds the comment worthy to respond to. Minus Wolverine, this is the Astonishing cast so it has to be Kitty and Carey / Bachalo are trying to use the Astonishing cast like how the other titles were trying to do as with Whedon / Cassaday’s run, those characters would have been stuck in a series that took months to release single issues, that the characters have to be accounted for in other titles. Good job whoever at comicbookdb added her to the list. I’m glad that I am in a constant rotation of making sure I’m up to date on my missing issues. Also, that I hadn’t already sold this comic. Really hating adding comics to my Wishlist as I’m not being given opportunities to buy back issues at this moment. Rogue states that she heard one of the soldiers say that either Pan or Pam as their boss. Which I like that, that comic characters don’t hear everything perfectly. Something about how comics and having the words be on the page, so we can clearly read them but that doesn’t mean that the characters have one hundred percent listening capabilities, plus it was in the middle of a battle. Cyclops states that they recovered hard drives so maybe the name will appear on those. Emma is still on Rogue’s case about the power borrowing. Xavier is overhearing all of this. He is able to walk, thanks to M-Day but he also has lost his telepathic powers. Cyclops is surprised he is still here as Xavier is going to be leaving with the Uncanny X-Men cast soon, which was Havok, Rachel, Polaris and Kurt. Xavier is asking Cyclops if he is going to overlook Rogue’s power stealing. Which at this point, as a reader, what is the big deal? She clearly only touched them for a tiny bit as the powers didn’t last, and the two of them were knocked out so it wasn’t like they were taken out of the fight due to Rogue. Scott stands up for Rogue and to Xavier stating it was a good call. Xavier makes the mistake of using the word, honesty, and Scott laughs in his stupid face saying honesty would be a fun experiment for Xavier to try. Scott walks away from him, Xavier ties to reach out to Emma to let Scott see, and Emma cuts him off as well, saying that Scott is the man Xavier made him to be. This panel is awesome as her word balloon is the only thing on the page, leaving Xavier completely by himself in an empty panel. Dragoon Mountains, on the United States / Mexican border. Sabreooth detects he has two visitors. Two different individuals, Feugo, the male and an unidentified lady, who I looked up is Aguja. 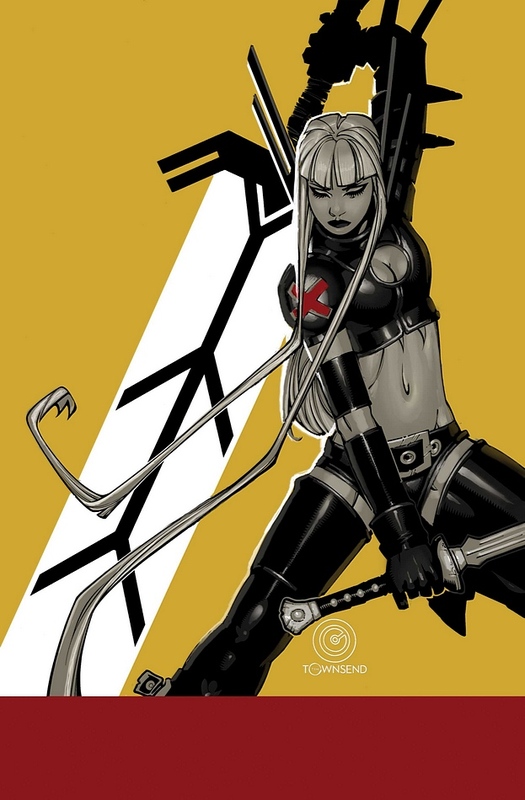 Who Bachalo received some criticisms once Magik’s new uniform was revealed. As it is a modified version of Aguja’s outfit. Instead of circles on her arm, Illyana’s outfit as spikes. Pretty familiar but who was going to remember that? X-Fans, that’s who! Even six years later. He himself probably forgot about the design. These two shoot at Sabretooth, he dodges. He wants to know how they turn off his healing factor. Fuego states that their weapons are far more advance than he can ever imagine. Sabretooth takes out a device, presses the button and sets off a bomb. He is hiding under the rock cliff and their tracking method can’t detect him with all of the surrounding rock. They suspect he made it to the river below and will follow that trail. Back at the mansion, Beast is explaining to Cyclops and Rogue who Omega Sentinel is. She is from Bastion’s Zero Tolerance arc but she broke from her programming to assist mutants. Beast is looking forward to the challenge of resembling her but he needs quiet. Now we get the scene that Carey has been building up to this entire time. Cyclops follows up with Rogue on how she would feel if she would like to lead her own squad, a rapid response unit. She won’t have any teaching commitments (I wonder if there was a scene where she expresses how she doesn’t want to teach, how many of the X-Men actually do want to?). Rogue knows that there is a need for such a team. She wonders why her, and Scott tells her that he likes how she takes risks and she is hard to predict, he likes her style. Rogue wants to know if she can pick her team, and he says, of course. They mention Gambit and how he is now a Horseman of Apocalypse and she replies that he made his choice. Of course, this is a comic book, so she really can’t just choose anyone on her team, different titles have to have different casts and some writers want their own characters to not be involved in other titles. So Carey has to make it so that Rogue chooses members that make sense for a team of her’s and not talk about who she wants and doesn’t want. Rogue wants Cannonball and Iceman, as they work well together. She also wants Mystique, who is spending time at the mansion. Cyclops is surprised as Rogue has been warning that Mystique is going to turn on them eventually. Rogue wants her close, so that when Mystique’s evil plan comes to light, she can break her arm. Beast, in a fun moment – this is fun Beast before he goes all genocidal, tells the two of them that he really needs some quiet and they should continue this conversation in the hallway. Scott is about to express how Rogue’s motivations for Mystique being on a team isn’t ideal when alarms start going off. Beast throws his hands up as he isn’t going to be able to work peacefully any time soon. One of the Sentinel O*N*E soldiers are shouting at Sabretooth to stay put. Sabretooth is holding a nameless female mutant as a hostage. So odd that even when they released the 198 Handbook, we still have unidentified mutants. Marvel tried to say it was an estimated number but in the comics, they had Cerebro with clearly only 198 results and such. Rogue’s team plus Cyclops confront Sabretooth. Cannonball tells the O*N*E soldier to back off, as per Sabretooth’s request. Cannonball blasts off at Sabretooth and Iceman saves the girl. Rogue, who has flame powers now, threatens to burn Sabretooth. Sabretooth asks her to hold up, he isn’t there for a fight. She asks if he is here for a super of sugar, or sug’ah as she says it. No, Sabretooth wants sanctuary, just like the X-Men said all mutants can have at the mansion. No questions asked. Which was silly on the X-Men’s part, who did they think were going to show up? Everyone but their enemies? I guess real world scenario, they can say no to him. What is he going to do, give them bad press? Issue ends with news footage of Nogales. There are first responders trying to deal with the damage. No ones what exactly happened. Was it terrorists or a natural disaster? What is worst is that there is a little girl who was in the heart of the destruction. The bomb took out an entire block. The little girl gets interviewed, it is in Spanish, which I like. That was an interesting take Lost took, if two characters are speaking a foreign language in front of a person who doesn’t speak that language, then we the viewer are not told what is happening but if that third party wasn’t there, we would get the translation. Plus, we live in an age that we can go online and get the translation ourselves, or it will be later explained to us. The newscaster states that the girl said, the X-Men did it. There is a bonus two pages of the X-Mansion at the back. It four paragraphs of what is going on covering the subjects of – Overview, Security, Technology and Current Status.